I eluded in a post the other week that my boat was a master class in efficiency and I thought I should show you why I think so. Firstly there's no main halyard! What! Yep no halyard. 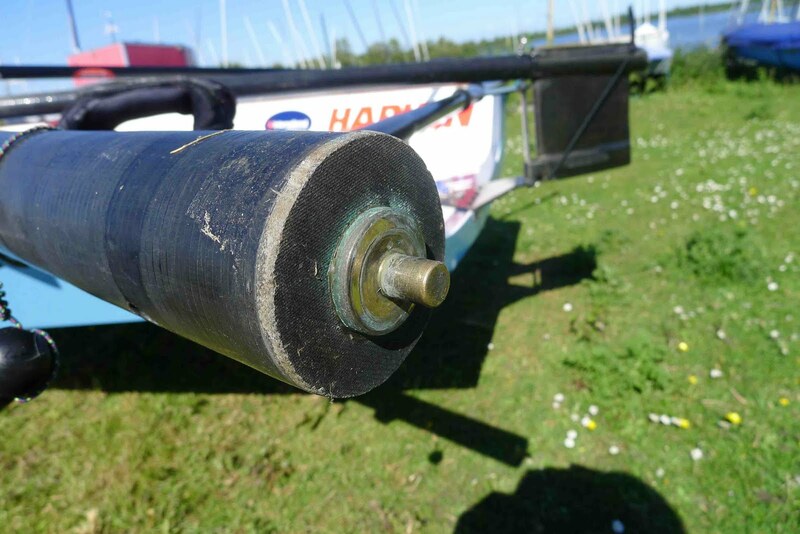 This saves the 2:1 compression on the mast allowing the mast to react as it should. So how do you get the sail up and err... down. Simples, roll the boat over to pull the sail up. My boat has a great trailer that incorporates a neat strap ( efficiency 1 ) and cradles that allow this to be done easily. The boat is also very light. 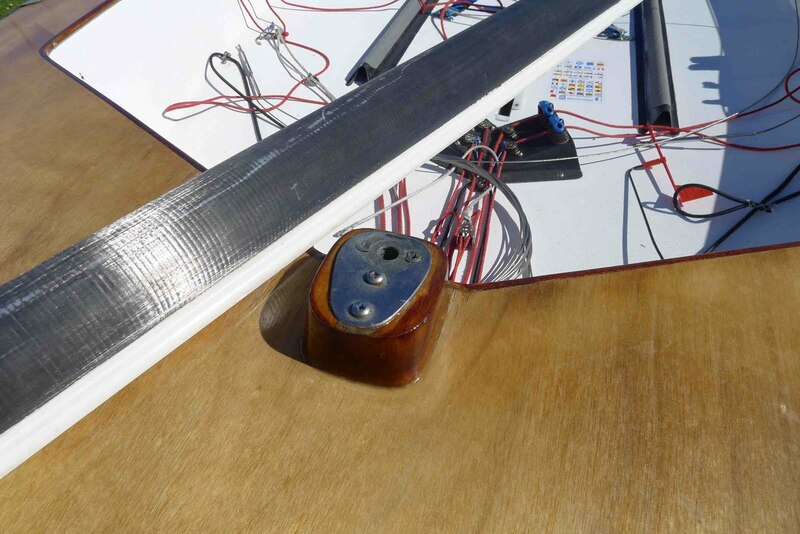 The main is attached to the mast head via a loop of spectra which is inserted behind a spinnaker piston hook which has been bonded into the mast tip ( efficiency 2 ). 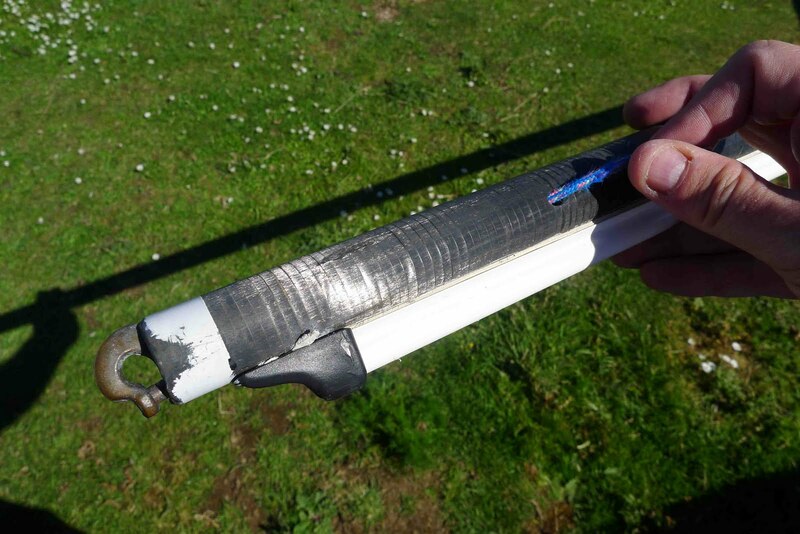 This is achieved by pulling a short rope tag attached to the spinnaker piston at the mast tip. 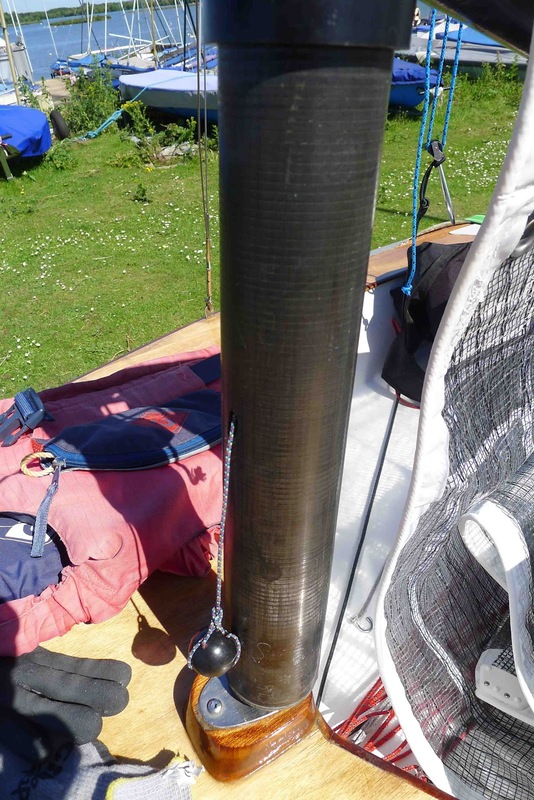 There is also a line that runs to the bottom of the mast, simply pull the line when you want to drop the sail and the piston opens. And you pull the sail down. 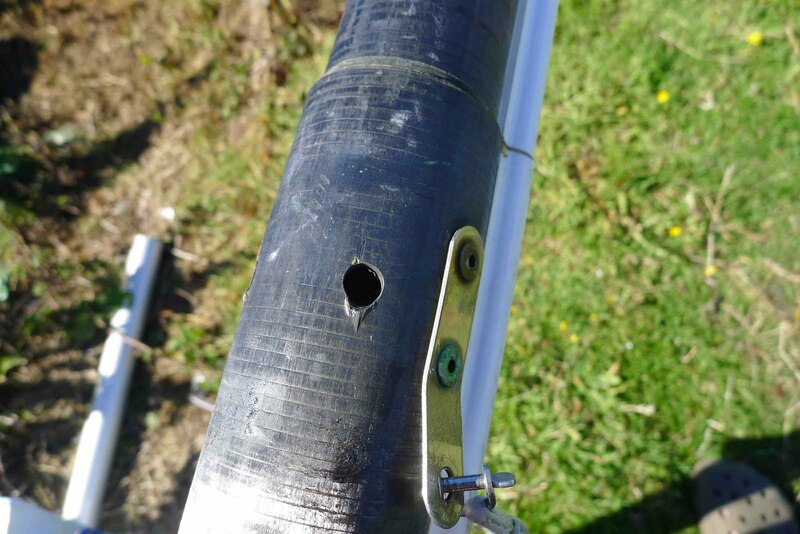 The shrouds and forestay terminals in the mast are just holes! ( efficiency 3 ) The terminals on the shrouds and forestay are hooks. You just hook 'em in the holes and put a bit of tape around them to keep them there. You remove the tape when you pull the sail up when the boat is on it's side. Stepping the mast is easy. ( efficiency 4 ) The shrouds have bottle screws. You attach one using a shackle ( no fiddely shroud plates and pins ). 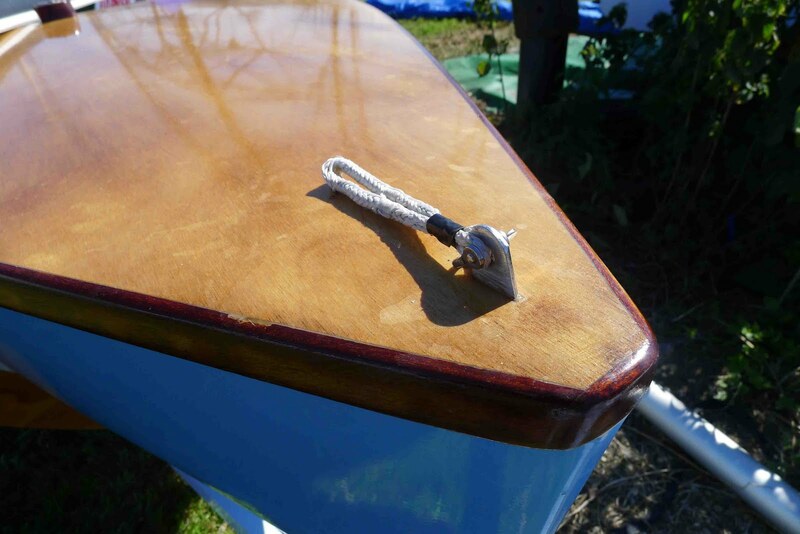 The forestay has a short spectra strop. You put the shackle through this and step the mast locating the mast foot pin in the mast step. Attach the lose shroud with a shackle. The rig is slack at this point. You then take a trapeze line to the bow. 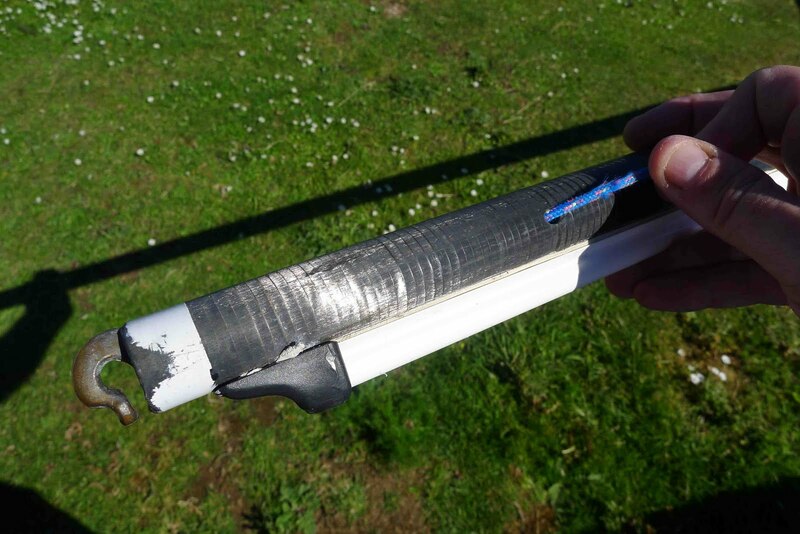 And using the bow trolley line tie the line to the trap hook to make a simple boat breaker. Pull the trapeze adjustment system until the forestay shackle can be attached to the deck eye on the fore deck. Release the trap line and your done. Oh there are some lowers as well but you just pop those on the shackle when you are doing the shrouds. Brilliantly simple, no extra bits of kit and less weight.